Welcome to Class 7's 2017/2018 Webpage! A final entry to say thank you for all your support this year. I have had a wonderful year with class 7 and am looking forward immensely to another year with all of them! Wishing you all the best over the Summer and will see you all in September raring to go! One of my final entries this year! It has been an extremely busy week with the Greasley Summer Fair and the Year 6 leavers performance being some of the highlight for the children. We have also had our own performance to complete this week, our summer finale performance of 'Running Wild' in front of the year 4 parents. We have been rehearsing non-stop this week and the children have worked their socks off to ensure that the performance ran smoothly and was to the highest standard possible. It has been a terrific effort from all the year 4 team! We have also finished off our maths lessons based around moving points on a grid and having an awareness of translation. Again, the children have shown real focus to ensure we have completed all our lessons within maths ready for a slightly more relaxed final three days next week. I will update you for a final time next week, so until then, have a lovely weekend. We are closing in on our final full week of the school year! This week has been based all around aspirations. We have therefore had the chance to discuss a number of potential future careers and had the chance to draw our dreams and where we aspire to be in the future. We also had the chance to look at a number of jobs and what possible careers we could be apart of in the future. Luckily, we have also had a number of volunteers come into school and provide us with a wealth of knowledge based around their own careers. We had guest speakers including a technical author, health coach and a scientist amongst others. We also had to squeeze in some final maths lessons and we have been looking at quadrilaterals, symmetry and also how to plot coordinates on a graph. Next week will be busy again as we start rehearsing for our final parental event based around our text this term, 'Running Wild'. I am looking forward to seeing you all next Friday for the performance which will include some dancing, singing, acting and poetry! With the end of term approaching, this week we have completed a number of assessments based around our grammar, punctuation and spelling targets within English. In Maths, we continued to look at shape and in particular, began to be able to identify different types of quadrilaterals and triangles. It was also great this week to be in our new classroom on Thursday, and the children had the chance to create some display work for next year based around their imaginations and what they like to get up to inside and outside of school! Next week we will be having our aspirational week where the children get to take part in a number of activities based around what they could potential do in the future! It should be another fun week leading up to the busy final few weeks of term! Wishing you a great weekend and enjoy the football on Saturday - Come on England! Another week has flown by and although I have been away at PGL with the year 6 children, I have heard some great things about what the class have got up to! In English, we had the chance to look at a music video by Chris Malinchak called 'Good to me' which showed a story about a young girl and her pet which went missing. We had the chance to discuss the range of emotions she would have felt during the video, from the time when she lost her pet right up to the time in which she was reunited with it. In maths, we have started to identify key angles which include acute, obtuse and right angles and how to spot these specific angles within shapes. We had the chance to answer a number of word problems based around angles and also discussed how we can make estimates of angles when looking at them visually. Across other subjects, we have completed a number of R.E lessons based around Christianity. This week we looked at important places relating to Christians and also completed a comprehension style lesson on some of the teaching of Jesus. This week allowed us to recap our visit to Twycross Zoo by writing a persuasive letter about whether Zoos should be banned or not. 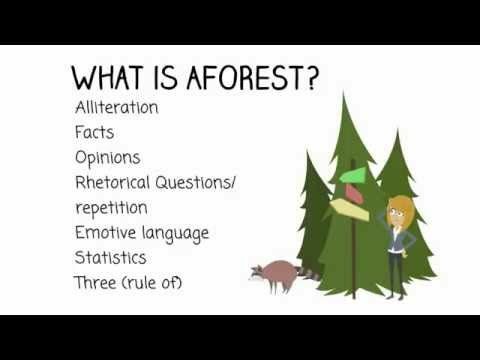 We were able to use a range of AFOREST techniques to help us write a really persuasive argument and most of the children were able to read out their letters with superb emotion and expression! In maths we had the chance to look at statistics and in particular our focus this week was on interpreting bar and line graphs. We also had the chance to draw our own by following key steps and making sure that our scales and use of a ruler was absolutely perfect! Across other subjects, we had the chance to take part in our own mini World Cup tournament within P.E and we also had the chance to start our new Science topic of electricity. We learnt about how electricity is formed and where we might find it within everyday household objects. Another great week in class 7, see you all next week! Our trip to the Zoo on Monday was superb and we had the chance to see a wide range of animals and had a few talks from experts about the animals. We also had the chance to sit outside and enjoy the sunshine which was great for the children to have a run around as well! A huge thankyou to all the helpers who came along, it made the day flow really well! During the rest of the week, we have had the chance in English to look at a number of different animals which live in the rainforest and write our own descriptive recounts of us possibly ending up meeting one! The ambitious vocabulary and use of higher level punctuation and grammar techniques is becoming second nature to the children at the moment and we had some incredible descriptions. In Maths, we have started our unit on statistics and the children have been looking at how to construct bar charts and interpret data from tally charts, pictograms and also line charts. We will continue to secure our understanding of these moving into next week. Also this week, we had Grandparents' afternoon on Thursday. It was a great success and the children really enjoyed producing some rainbow themed jungle art based around our topic. Again, a huge thankyou for all the Grandparents who came along. Next week continues to be busy, with a number of children attending district sports next Wednesday. I am expected some amazing results as always! A very short week to start the half term but it was definitely a busy one! We had the chance to run through our sports day routine, and although it has been cancelled due to the weather, we will be raring to go when it is re-arranged! We have also had the chance to discuss our trip to Twycross Zoo and managed to design our own Zoo and included a number of key features by sticking to a specific budget! In English, we had a recap of GPS targets which included determiners, the 'a' and 'an' rule and also writing a range of dictated sentences, ensuring that we could use the correct spellings and punctuation within our sentences all of the time. In maths, we had a week of times table revision and ensuring that we were up to speed with all our written methods. We played a number of games and activities which allowed us to reinforce these skills. See you all on Monday for our trip! Having come to the end of another half term, I would just like to say thank you to all the children for their efforts. They have worked relentlessly this half term and produced some magnificent pieces of work within English, Maths and our other curriculum subjects. It has also been great to see many of the children within class 7 also performing so well at sporting activities when representing the school. As for our topic based book, we managed to finish it this week and write our own diary entries about Will's thoughts about being rescued from the jungle by his grandparents. In maths, we had a week on time and were able to convert between seconds and minutes, along with days and weeks. A final note that we come back to school on Wednesday 6th June. Also sports day is on Friday 8th June. Apart from that, I wish you all the best on your half term break and see you for the final part of the summer term! Another busy week has allowed us to work our way through our story of 'Running Wild'. This week we produced some fantastic descriptive pieces of written work based around the jungle fire which Will was trying to escape from. We packed our writing with lots of adjectives, adverbials and figurative language techniques including similes, personification and alliteration. We also met a new character within the text called Dr Geraldine and we had a chance to interview her and ask a range of questions about her sanctuary for animals. In maths, we have just finished a full week on money! We firstly looked at how to convert between pounds and pence, then ordered a range of monetary values and finally had the chance to look at a number of word problems based around written methods. Also this week, we had the chance to celebrate the Royal Wedding and carried out a range of activities to celebrate the special day. Creating our own wedding cake designs and producing bunting for the day were just a few of the tasks we carried out as a class! Thanks for all your support once again and see you all next week! I have been absolutely delighted this week with all of the classes work based on our story 'Running Wild'. Having finished chapter 7, when Oona (the elephant) is reunited with Will, we then had the chance to write the first page of the next chapter. We then had to see how accurate our writing was to that which Michael Morpurgo had written. There were some deep, emotional descriptions of the meeting between Oona and Will and all of the children managed to write in the style of Micheal Morpurgo, with constant reference to scenes which had occurred previously in the story. A great effort this week! In maths, we finally finished off our objectives based around decimals. In this final week on them, we looked at how to round a decimal to the nearest whole number and also became aware of simple fractions such as 1/2, 1/4 and 3/4 and their decimal equivalents. Across other curriculum subjects, we carried out a number of geography lessons this week, looking at the Indonesian jungle and the animals which live there (all relating to our story). We then created our own jungle animal to live in the canopy or on the ground and had a real mix of unique designs and names for our animals. We also used ipads to locate the main rainforests in the world! Another great week in class 7! See you all on Monday! 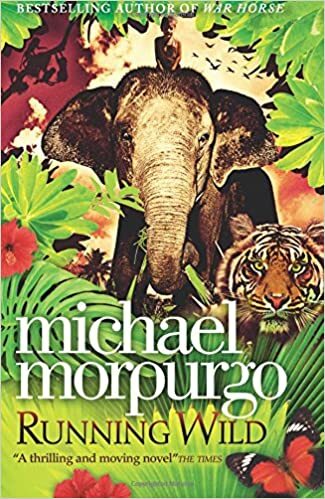 This week in class 7 we have continued to find out about William's epic adventure into the jungle in our book 'Running Wild'. He has met up now with some fearsome characters including Mr Anthony who currently has him captured! In lessons, we have had the chance to research some of the animals which William is captured with, including some monkeys and tigers. The children then produced a non-chronological report based on a chosen animals using ipads to research and then present their report on A3 paper. In maths, we have continued with decimals and have looked this week at how to compare using inequality signs and also order decimals to 2 decimal points. All of the class have worked extremely hard to master this as there has been some confusion at how to spot that 6.4 is larger than 6.14! An easy mistake to make! Across the other subjects, we have had the chance to discuss a number of PSHE based objectives looking at friendships. We also have carried out a Geography lesson based on volcanoes - including some from Indonesia (where the theme of our book is set). In P.E we have continued improving our tennis skills and practicing the long jump and triple jump as part of our athletics unit! Giving out the forms a month in advance will hopefully give you the chance to spread payments if needed so the children can all enjoy a great day out on the 11th June! If there are any problems please let me know. Also thanks for all the offers for parent helpers on the trip. I will work out numbers and how many can fit on the coach and then confirm with parents who have offered. It is great to see lots of you willing to join us on the day! Enjoy your extra long weekend (and the sun) and see you all on Tuesday! We have had another great week reading 'Running Wild' and finding out about William and his adventures with Oona the Elephant within the Indonesian jungle. We had the chance this week to write our own 'Tanka' style poems which had to follow a particular format involving specific amounts of syllables. The children really enjoyed this and produced some wonderful jungle poems conveying William's emotions about living in the jungle. In maths, we continued our revision of decimals and looked at a range of word problems which involved sequencing problems and converting between fractions and decimals. Although the weather was wet, we also managed to carry out a number of circuit training lessons within the hall to ensure we kept fit! Finally, we also had the chance this week to write up our tanks poems and create a jungle background using collage techniques. Our display board is now full of the poems and full of jungle designs! The first week back allowed us to utilise as much of the beautiful weather as we could by carrying out a number of activities outside! In P.E we had the chance to begin our athletics topic by practicing our throwing and long jump techniques. We also carried on developing our tennis skills with a range of games involving the control and striking of a tennis ball. In class, we started reading the first few chapters of our book, Running Wild and we carried out a character description of Will, the main character within the book. We then started to brainstorm and develop ideas for a piece of poetry which we will write next week based around the jungle theme along with Will's emotions as he ride an elephant through the jungle! In maths, we carried out a number of revision sessions to continue practicing what we have learnt so far in terms of decimals and fractions. We also practiced our arithmetic skills including the multiplication of 3 numbers, compact multiplication and the addition of fractions with the same denominator. I will see you all next week! We have had another superb term and would like to thank the children for all their efforts over the past weeks! Our topic on David Walliams has come to an end with our next topic of focus 'Into the Wild' beginning in the summer term. The text we will be looking at is Running Wild by Michael Morpurgo. So if you would like to do some research over the holidays then feel free to do so! Have a great Easter break and I will see you all soon! We had a great time this week keeping fit all in aid of Sport Relief! Many of our afternoons consisted of rowing or running miles around the school to try and reach our class target of covering 150 miles during the week to help the whole school eventually reach Russia in terms of miles covered. I am proud to say that we absolutely smashed the target by reaching 226 miles during the week. An amazing achievement from everyone in class 7! Across other subjects, we continued with our topic of the World's Worst Children within English and tried to create our own World's Best Child and write a detailed description about them in the style of David Walliams himself. There were some really interesting characters created including Perfect Peter, Homework Holly and many more! In maths, we continued our understanding of decimals and became confident looking at hundredths and tenths and how we could convert between them into fractions and identifying them visual using a range of techniques. Overall, another busy and enjoyable week. With just 4 days left, we may also have the chance to watch the movie of Ratburger next week - the book we have been reading in class and almost completed! Another exciting week in class 7 has flown by! This week we have had Science week and luckily we had the chance to have a number of children come in from Hall Park to allow us to design our own rockets to be tested in the hall. The children had the chance to make a couple of designs and re-work their designs to see how far their rocket could travel. We had some really inventive designs and I believe one of our rockets managed to travel up to 10 metres across the hall which was very impressive! We then also had the chance for a number of parent's to come into our classrooms on Thursday afternoon to help out with our new Science display based all around digestion. This again, was another fantastic opportunity for the children to showcase their talent in front of the adults and we had some fantastic combined pieces of artwork from the children and parents! A huge thanks to all the parents who came and joined in with their child's learning. It was a great afternoon. In English we completed a number of independent writing tasks this week, including the design of our own World's Worst Child - and we certainly had some interesting designs! The children then wrote their own paragraphs about the characters in the style of David Walliams. In Maths, we continued to look at decimals and converted tenths and hundredths from fractions to decimal numbers. We also became aware of what decimals were and used our newly found knowledge to help us complete problems on number lines. Another busy week and I look forward to seeing you all on Monday for the final few weeks of term. With it being Sports Relief next week, I am sure we will be carrying out a number of physical exercises! So get yourselves ready! To begin the week, we had our World Book Day which was carried over from the previous week due to snow. The children all had the chance to read a number of stories from our author of choice - David Walliams, and we managed to produce our own biographies all about him using laptops. In the afternoon, we had the chance to read to Early Years which the children really enjoyed! We also heard a number of extracts from David Walliams and produced an artistic drawing based around Dribbling Drew and his adventure at the museum! Within English, we have continued to look at different letter types and become accustomed to using the correct layout when writing a formal letter. We stepped into the minds of Dribbling Drew and produced our own letters of apology to the museum for what Drew did on that famous day! In maths, we have continued with our work on fractions and become used to adding and subtracting fractions with the same denominator and also having an awareness of how to find fractions of amounts. We managed to also create our own fraction mazes which we tested with our partners to see if they could be solved. 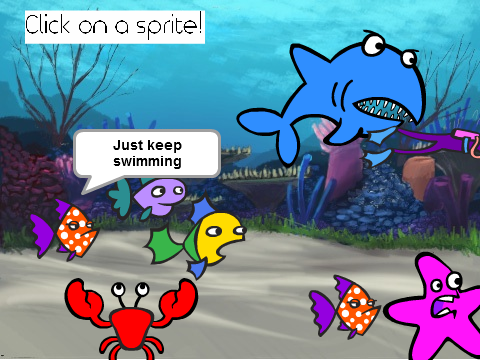 This week has also seen us begin our computing lessons based around Scratch. We have managed to become used to the Scratch software and begun to program our sprites (characters) to move, talk and make sound. We will be designing our own worlds in Scratch over the coming weeks! Below is an example of the type of worlds the children can create through coding. I hope you have an enjoyable weekend and see you next week ready for science week! A brief update this week due to the Snow and closure of the school for the past 2 days! A quick reminder for next week that World Book Day will now take place on Monday 5th March. I look forward to seeing you all in your outfits and we will be carrying out a number of activities based on our chosen author - David Walliams! Also Parents' evening times for Tuesday and Wednesday next week will be given out at the end of the day on Monday. Thanks for your patience over the past week and hope you have stayed safe and enjoyed the snow. A brief update as we enter the half term! A big thank you to all the parents who came and helped us out with our trip to Colliers Wood this week. It was absolutely freezing but we still managed to complete some outdoor maths, even though our hunt for mini beasts was scarce! We also managed to finish our stories based on Mr Stink this week and produced front covers and blurbs for them. We also managed to read some aloud to the class. They were absolutely incredible and the children's imaginations were out of this world in terms of the characters they created! Finally, there is no homework set over the half term break - I wish you all the best and have some fun and relaxation ready for the lead up to Easter! We will be looking at The World's Worst Children when we return, so if you want to get used to the texts over the half term that would put you a step ahead as to what we have planned for you! We are almost at the end of our work based around Mr Stink, and this week we have begun to write our own stories about ourselves meeting a tramp. 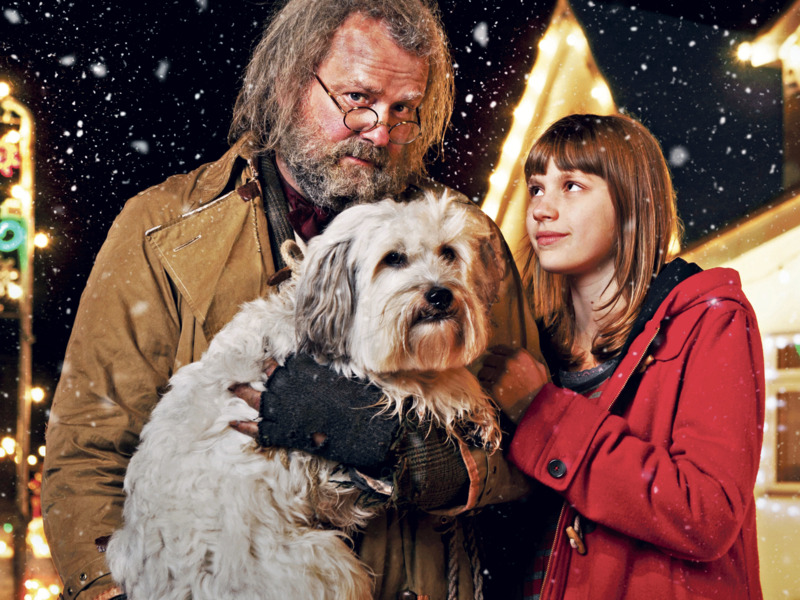 We have had to decide on where we have to hide the tramp in our house and what secret back story he has - very similar to the actual story of Mr Stink! Once we have completed our stories we hope to type them up onto a word document next week and printed onto card for the children to take home! In Maths, we have started to look at fractions by understanding what a fraction actually is and beginning to spot equivalent fractions. We have also had the chance to really test a few Maths superstars by completing a 15 in 10 rather than a 10 in 10 test this week, really showing off their arithmetic skills. In P.E we had a fantastic time having the chance to take part in a full hour of yoga on Tuesday afternoon. The children seemed to really benefit from the session and certainly seemed relaxed and calm throughout. We have another busy week ahead during the final one before half term, so I wish you all a relaxing weekend and see you on Monday! We have had a fantastic week with much of our afternoons being taking up creating and making Mr Stink's shed. We had some superb designs and the children really enjoyed creating a host of ideas about what they could make and put inside! We have given the children the choice of taking their sheds home today, so apologies for the extra load to carry home! In English, we began to look at inverted commas and how they are used in writing. We also had the chance to write our own conversation between Mr Stink and a Gameshow host, as if he was on national T.V like he is in the book. We ensured that we were using inverted commas to 'hug' our speech, and remembered other key rules such as new line, new speaker. In Maths, we had a full week looking at area, identifying what is was and then making a range of rectlinear shapes to add up to specific square cm. We then had the chance to test our understanding of area by looking a range of words problems relating to it during the week. This week, we have also finalised a short visit to Colliers Wood on the 14th February to look specifically at a range of living things and carrying out a range of activities based on the wildlife around the area. Could you let us know if you are able to help out, as it would be great to see as many adults as possible there to assist with your own child's learning. Until next week, have a lovely weekend! Our third week into the term, and we have continued to discuss and complete a range of activities all around our book for the half term - Mr Stink. We completed a number of comprehension tasks this week - one about Chloe's mother and he interview on Question Time and also about when Chloe lost Mr Stink only to find him bathing in a pond at the bottom of the garden! We have also had time this week to ensure that we are ready to create our own shed for Mr Stink next week. Thank you for bringing in all your cardboard boxes and a range of plastics which I am sure will help us to create some amazing sheds! This week, we completed a design brief to ensure that we gathered a range of opinions and thoughts to allow us to plan Mr Stink's shed as accurately as possible! In Maths, we continued to look at multiplication and completed problems involving the grid method and began to look at division and how we could solve a range of 2-digit divided by 1-digit number problems through different visual techniques. In English this week, we have started to become used to using a range of persuasive techniques within our writing. We had the chance to plan and then write a persuasive letter to our parents highlighting the fact about why being smelly can be such a positive thing. We spoke about different things you might get up to, such as clearing the cinema or ice rink because you smelt so much. This is very similar to what happens to Mr Stink when he manages to clear out a coffee shop because of his vile stench! In our letters we had to ensure that we gave a number of positive reasons to be smelly and contained a range of AFOREST techniques in our persuasive writing. In Maths this week we had a recap of multiplication and looked at how we could use different methods to help us solve a range of problems. We looked at the compact grid method as well as using partitioning and arithmetic skills to solve these multiplications in a more efficient way. 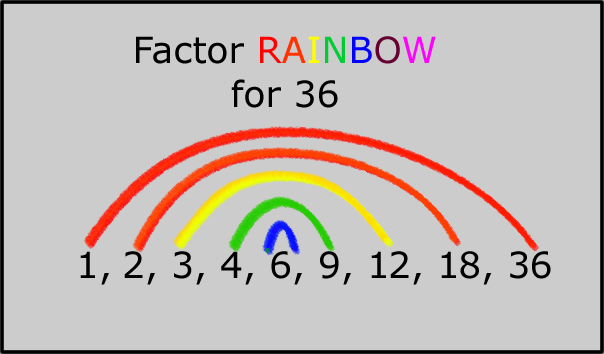 We also were introduced to factor pairs and had the chance to create our own factor rainbows and factor bugs in our books! In terms of other subjects, we continued our orienteering work in P.E and practiced a number of techniques including dribbling and shooting in hockey. We also had the chance to create some one-point perspective drawings within Art which all the children enjoyed hugely! A quick reminder: A letter has gone out today regarding our DT project for the next couple of weeks based around Mr Stink and his shed. The children will be designing their own shed for Mr Stink to live in in a couple of weeks. If you have any cardboard, plastics etc spare, then please bring them in so we can make some fantastic sheds in a couple of weeks time! Thanks for all your support + see you next week! It has been a busy first week back and we have had the chance to really tackle our new topic of Mr Stink head on! We have discussed Mr Stink's back story and wrote our own detailed back story about what he might have done in his past. We also had a look at a number of passages from the book and spoke about pronouns and how they are used effectively within written work. We have also started another David Walliam's book - Billionaire Boy, which we will continue to read as our class book throughout this half term! In Maths, we have been recapping our multiplication skills up to 12x12 and also started to look at how we multiply 3 numbers together. We have identified how multiplication is commutative and how we can use different strategies to solve a range of multiplication problems. We have also had the chance this week to test our Art skills by trying to sketch some Mr Stink drawings just like Quentin Blake. We also managed to use watercolours to create effective pieces of Artwork to go on our David Walliam's display! In P.E we have started orienteering and also hockey. Our P.E slots have stayed the same this half term - can you ensure that your child has their P.E ready for Tuesday and Friday afternoons. It has been a great first week back and it has been fantastic to see all the children really engaged in the new topic! I look forward to seeing you all next week! Just a few quick words this week, to say a huge thankyou for all your efforts this half term - it has been a long one! There were superb performances in the Christmas Carol performance this week, and I also must thank the children for an amazing effort during our 'boot camp' morning this week which included the 'beep' test! One final reminder, there is no homework set over the Christmas period. Just make sure that you bring yourselves back in the New Year raring to go! A Merry Christmas to all of you and see you in 2018! One week to go! It has been an extremely busy week in class 7 and we have had a number of rehearsals throughout the week to ensure we are ready for all of the performances next week. The children also had a range of tests to complete and we had some great results in our 50 word spelling test! In P.E, we had the chance to create our own obstacle courses and games based on what we have learnt throughout the first term involving throwing, catching and ball skills. A quick reminder to let you know that there is no homework set over the weekend - with lots of performances in the evening next week, it is a good time to rest up! Look forward to seeing you all for a final, busy week before Christmas!! It was our final week on instructions, and we all had the chance to write one more set based on a Greek Mythological creature of our choice! Lots of the children decided to choose either a Minotaur or Hydra as our creature which we had to capture. We found out where these beasts lived and what they were like and then wrote our instructions using all key success criteria including time connectives, adverbs, imperative verbs and bullet points. Some of the creatures were very scary including Medusa below! In Maths this week, we looked at tricks and tips about how we can divide by 1 and 0. We then continued to look at division facts of all our times tables up to 12x12. With rehearsals taking place most days for the Christmas concert, we had the chance to carry out a range of times table games and practice. Finally, I would like to thank all the Grandparents who came into class on Monday afternoon. It was great to have you all in there and the children certainly enjoyed themselves. There was also some wonderful pieces of Artwork produced! Thanks again and see you all next week! In English, we have continue to look at sets of instructions and managed to look at another Greek Myth based on Theseus and the Minotaur. With our knowledge of instructions now at an absolute high, we had the chance to write up our own version of how we could potentially capture a Cyclops living on the island of Crete. Being such a dangerous creature, we had to ensure that we used Ancient Greek methods to capture him, without the use of any day modern equipment of resources. We then used a range of imperative verbs, bullet points, time connectives and a top tip to ensure our instructions were clear and precious for our reader. All the children did a superb job! In Maths, we started to look at the multiplication grid method involving multiplying 2 and 3 digit number by a 1 digit number. Our focus was on the layout and understanding our times tables to ensure that the mistakes we made in our pieces of work were minimal. Across other subjects during the week, we had the chance to discuss the 'Journey of Life' and produced our own timelines as to what could be the major events which we might face in our future. We had a great discussion and some of the children provided some interesting ideas as to what they would like to happen and when! Finally, we continue with our Science topic of sound and tested our own soundproof room to decide which material absorbs sound the most. Also a huge congratulations to Thomas who received our Science Star award from Mrs Clarke this week. This week has allowed us to begin to look at sets of instructions and analyse the key language and structural features from a range of texts. We managed to make suggestions about how instructions could be improved and what was essential information which we needed to include. We also tried to write our own instructions to get from our chair, across the classroom and out of the classroom door! We had to be so specific and give really clear instructions which led to a few people knocking into chairs and walls! We really enjoyed watching the below video based on how to make a Jam Sandwich, and it most cases, it ends up going horribly wrong because of some unclear instructions! In Maths, we have had a week looking at perimeter and finding ways to calculate the perimeter of rectlinear shapes as well as composite shapes with missing sides. We also completed some superb work in Science this week, conducting an experiment to find out why the same sound is louder when it is closer to us. The children managed to use some fantastic technical vocabulary, mentioning sound waves, vibrations and dispersion. Great work Class 7! This week we continued to look at non-chronological reports and finally had the chance to write up our reports on Ancient Greece in best. We had some superb designs, focussing on the layout and presentation was key! For our GPS focus, we looked at determiners, what they are, and identified them in a range of sentences. In Maths, we continued to look at column subtraction and addition. However, we looked specifically at different word problems and used inverse operations to help us solve a range of trickier questions relating to the column method. In P.E we continued with our dance lessons on Tuesday, and also continued to practice our skills with Football on Friday. We also had the chance to discuss friendships this week, and produced some Anti-Bullying posters to tie in with Anti-Bullying week. We also had the chance to discuss equality, and in particular looked at children who are affected by a range of issues which also tied in with Children In Need. Until next week, I hope you have a lovely weekend and see you all on Monday! Check out the additional information tab above for information regarding P.E, Home School Diaries, Reading Books, Spellings etc.